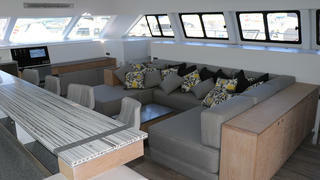 The second hull in the Open Ocean 800 series of expedition catamarans has been delivered bearing the name Cake. This 25 metre catamaran motor yacht was built from GRP by South African yard Two Oceans Marine to a design by Anton Du Toit. As with all multihull superyachts, Cake boasts an impressive beam for her length. 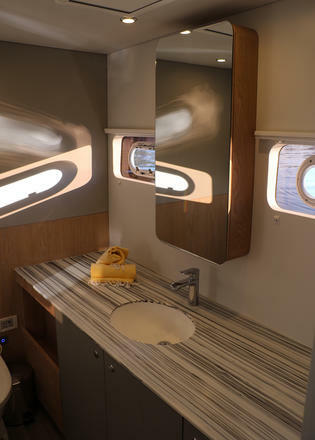 The broad 11 metre span creates plenty of space for her eight guests to spread out across four en-suite cabins, all of which are fitted with king-size beds. 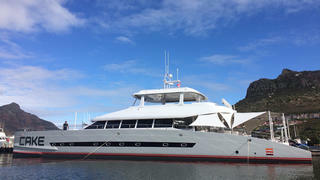 Along with her sister ship Ultra Vires, Cake is the joint largest catamaran motor yacht to be launched in South Africa to date. 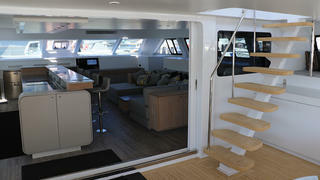 Two Oceans Marine modified the layout for Cake, creating a slightly smaller saloon than Ultra Vires, but freeing up more space in the cockpit, which is fitted with a dining table, barbecue and drinks fridge. The yard added that Cake’s owners plan to use her for kite surfing in remote superyacht destinations, and as a result, the aft deck tender garage was a key requirement. This area can be used to launch numerous superyacht water toys, including a Jet Ski, a 3.2 metre dinghy and a 5 metre main tender. Cake can also tow a 15.2 metre maxi tender when needed. Power comes from a pair of 305hp Cummins QSB 5.9 MCD diesel engines for a maximum cruising range of 4,500 nautical miles at nine knots. Other projects currently under development at Two Oceans Marine include the first Open Ocean 740 performance sailing catamaran, which was recently launched and named Skimmer.